A funny thing happened to Nick Doob and Chris Hegedus on the way to making their documentary on Reverend Al Sharpton. While Sharpton was seeking to run for the office of President of the United States, his organization decided they should be making that documentary film themselves. Doob and Hegedus found themselves all suited up to make a movie, but with no one to make it about. As luck would have it, another politically edgy news story was breaking — Fox News was about to sue Al Franken for trademark infringement. Fox presumed to claim ownership of the phrase ‘fair and balanced.’ This story, too, did not pan out for Doob and Hegedus. But the seeds of something very powerful had already taken root, for Al Franken was proving to be not only a foe not willing to back down from a bluff, but willing to go after the bullies behind it. 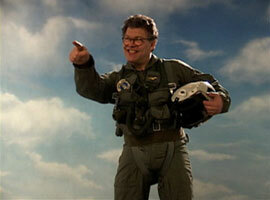 And so begins the documentary Al Franken: God Spoke. Franken’s legal entanglement with Fox caused his book Lies and the Lying Liars Who Tell Them to shoot up to the top of the New York Times bestseller list. Doob and Hegedus were ready and eager to follow Franken around, to document whatever his book tour might turn out to be. Their investigative journalists’ noses led them straight into a fascinating cinema verit�, which bears witness to the political transformation of comic Al Franken. Franken’s acerbic wit, his keen and incisive intelligence, and his almost na�ve, grounded ethical confidence mark him as a one-of-a-kind comic with conscience. As, step by step, Franken’s political faith leads him into doing the next right thing, he soon emerges in the political limelight of America’s re-emergent left. At times, Franken appears to be a twenty-first century Mark Twain. To the radical right, he is a proverbial thorn in their side. One ‘fair and balanced’ right-wing pundit’s attempt to dismiss Franken with standard demonizing hate language included cheap anti-Semite smear tactics. ‘I am the only New York Jew,’ as Franken wryly points out, ‘who grew up in Minnesota.’ (The Land of a Thousand Lakes has been a hotbed of twentieth-century America’s progressive left activism.) Affable, convivial, and even puppy-like in his personable manner of cozying up to the very people whose politics he detests, Franken seems to know, and to get along with, everyone who is anyone in Washington politics. The film contains numerous impromptu comedy sketches, an impressive array of cameo appearances of Washington insiders, and stirring documentary footage of private moments captured. A real gem of documentation is the documentary-within-a-documentary of the launch of Air America Radio, paired with Franken’s head-on confrontations with his self-declared enemies from the news media’s right-wing star propagandists, Ann Coulter, Sean Hannity, Bill O’Reilly, and Karen Houghes. Franken even delivers his impersonation of Henry Kissinger to Henry Kissinger at a cocktail party, where it appears everyone except the hostess (a personal friend of Franken) considers him a gate-crasher. Always engaging, often insightful, at times deeply moving, Al Franken: God Spoke is not for the faint of heart. Clearly partisan on behalf of the left, this documentary does not blink. However, it may cause the audience to flinch, cringe, or grip the arm rest of their movie house seat as Franken not only does not back down, but goes out in search of one more Goliath after another to challenge. Al Franken is more than a tough act to follow; he is, potentially, a political hero for these times. Doob and Hegedus’s great good luck in being present to capture this book-signing tour-turned-campaign trail is matched by their consummate skill in discerning and documenting history-makers in their burgeoning moments. Its partisan nature is part of the gift of this sublime bit of documentary work.